A thorough but subjective political biography, Nixon features a dedicated Anthony Hopkins performance in the title role, but otherwise suffers from an unbalanced tone and never finds a rational perspective. With the evolving Watergate scandal of the early 1970s providing an anchor point, the film jumps around the history of President Richard Nixon's life. There are scenes from his childhood years, with Nixon raised in a relatively poor but proud household. His strict father owned a grocery store and saw life as a daily struggle, while his mother (Mary Steenburgen) took on the duties of instilling the fear of God in her children. Tragedies involving tuberculosis struck two of Nixon's brothers during his formative years. An ineffective football player in college, Nixon's lack of a tony education at an elite university remained a constant source of inferiority and self-doubt. Nixon rose to prominence as part of Senator McCarthy's communist witch hunt team, and became a two-term Vice President under President Eisenhower. There are vague hints that Nixon was involved in planning the Bay of Pigs fiasco. His long-term backroom team consisted of advisors Bob Haldeman (James Woods), John Ehrlichman (J.T. Walsh), and John N. Mitchell (E.G. Marshall), and together they seemed destined for the top. But Nixon's political career was derailed when he narrowly lost the 1960 presidential election to the young, suave and rich John Kennedy, a defeat that deeply humiliated Nixon. A further setback in the 1962 California Governor's race seemed to end Nixon's career in politics. He makes a promise to his wife Pat (Joan Allen) to never run again for public office. The assassinations of John and Bobby Kennedy and President Lyndon Johnson's surprise decision not to run in the 1968 election collectively pave the way for an unlikely comeback. Spurred on by a group of right-wing businessmen and anti-Castro dissidents, Nixon achieves his dream and is elected President. He is immediately confronted by a nation deeply divided over the bloody Vietnam War, a conflict that Nixon struggles to end. 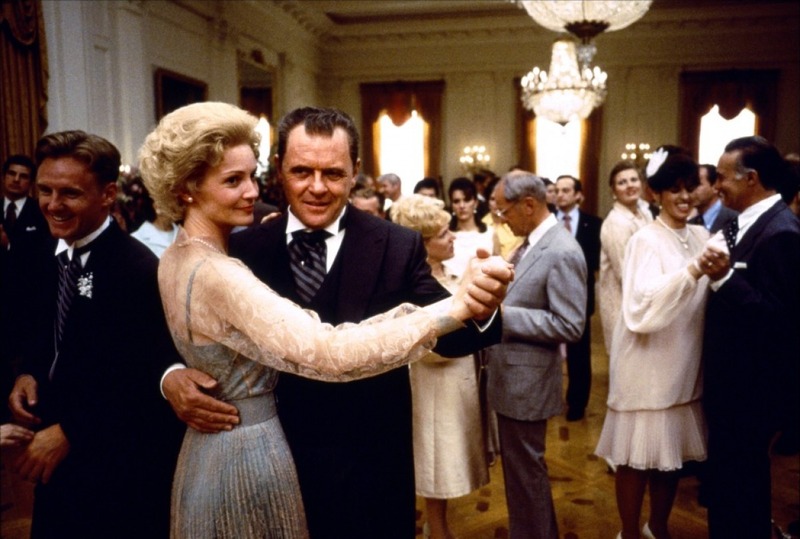 With the assistance of Secretary of State Henry Kissinger (Paul Sorvino), Nixon achieves better success in foreign relation, with his 1972 visit to China a particular highlight. But with leaks to the media creating a steady stream of bad news stories, Nixon's White House descends into a siege mentality, and he believes all the bad news stories to be personal attacks. Nixon introduces an elaborate eavesdropping system to have all his conversations taped, and a surreptitious team of "plumbers" including Howard Hunt (Ed Harris) and Gordon Liddy (John Diehl) is created to plug leaks and dig up dirt on Nixon's perceived enemies. The plumbers initiate the clumsy Watergate break-in, and the subsequent White House cover-up proves to be the undoing of the President. Directed and co-written by Oliver Stone, Nixon is an impressive history of probably the most controversial President to ever occupy the Oval Office. With the Director's Cut running towards 210 minutes, the film is an in-depth retrospective and attempts to touch all the key events in Nixon's life, from childhood to resignation. 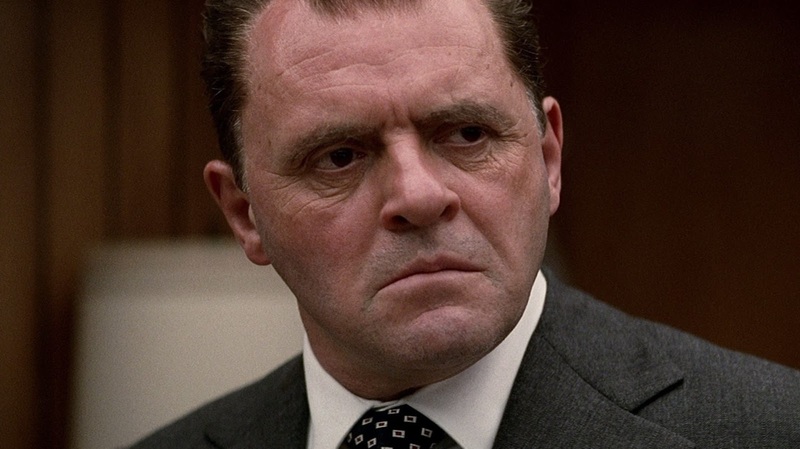 With Anthony Hopkins dominating the screen with a bearish stance and a politician's larger than life persona, the film rarely drags, despite its enormous breadth. But what Stone fails to do is settle on an angle of approach. The film mixes tones of conspiracy into a straightforward biopic and adds elements of overwrought tragedy. Stone clearly has limited respect or admiration for his subject, and spends an inordinate amount of time presenting Nixon as an uncouth brawler, close to paranoid, probably involved in a deep dark conspiracy, obsessed with Kennedy, and unable to separate his personal identity from the nation's politics. It's a disappointingly shallow treatment of a complex subject, with the director's disdain wrapped in an auteur's vision of grandeur. Stone also appears to lose his nerve towards the close of his epic. Perhaps realizing that a mammoth film about a man being portrayed as almost cartoonishly flawed is a self-contradictory project, Nixon ends with a rush to demonstrate sympathy and elevate Nixon's legacy to places that the film cannot support. When Stone has his opportunities to underline Nixon's achievements, for example the historic trip to China, ending the Vietnam War or thawing the Cold War with Russia, he offers barely any context and instead fritters away these scenes with trite directorial touches and the most inane dialogue between world leaders. Stone goes out of his way to mock Nixon's achievements at every turn, but then realizes his oversights too late. Stylistically the film falls victim to Stone wanting to provide constant reminders that he is in charge. Intermittent black and white photography, fake grainy film stock, character hallucinations, and editing stunts are deployed in large numbers to jazz up the film, but often serve to distract rather than enrich. The Director's Cut features a particularly awful long scene featuring a meeting between Nixon and CIA Director Richard Helms (Sam Waterston). The sequence is bloated with endless close-ups of flowers, and should have forever remained on the cutting room floor. The scenes between Nixon and his wife Pat emerge as the best avenue to get to know the man, and here Stone does better. With Joan Allen standing her ground against Hopkins, the stressed connection between career politician and suffering wife provides a lens onto Nixon's talents: charming when needed, always persuasive, quite stubborn, and power hungry at the expense of almost everything else. 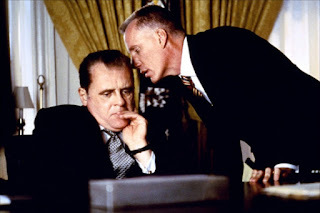 From the huge supporting cast, James Woods as Bob Haldeman, Powers Boothe as Alexander Haig and David Hyde Pierce as John Dean make the deepest indents. Paul Sorvino and Bob Hoskins have fun in breezy portrayals of Kissinger and J. Edgar Hoover respectively. Nixon is a flawed epic, a biography that impresses in scope and dedication but that also veers too far into jaundiced territory to do justice to its subject.